Last week, I received new running gear! Yay. Always a fun thing! I got a CamelBak Circuit Hydration vest to help with hydration on longer runs with little access to water. 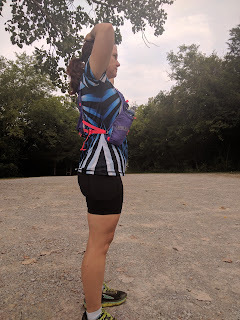 I have an Amphipod belt that I used during marathon training, but when I put 4 water bottles on it (40 oz or 1.2 liters total), I had trouble with the back ones giving me some bruises. So I decided to try a vest. Shoutout to my mom who helped me decided what color to get. They have a purple one and a black one. The black one has blue trim. The purple one has "fiery coral" trim. In the pictures online, the trim looked red. I don't generally like red and purple together. But my mom said to get that one anyway. So I did. When I got the vest, the trim is more hot pink than red. I'm not a big pink person, but hot pink is ok in the right circumstances and this is one of them. 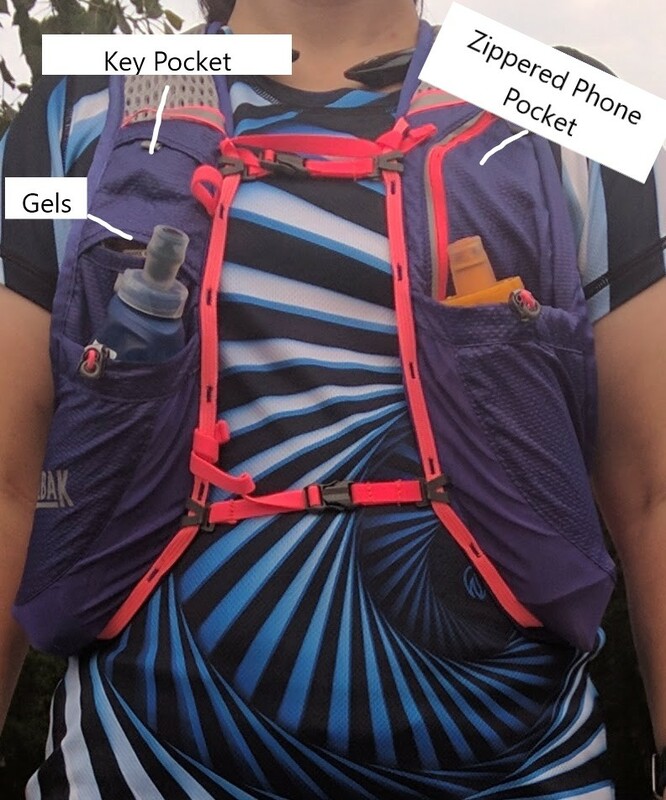 The Circuit vest has 2 front pockets that are made to hold soft flask water bottles in addition to the 1.5 liter bladder in the back. The vest did not come with the water bottles, but did come with the bladder. 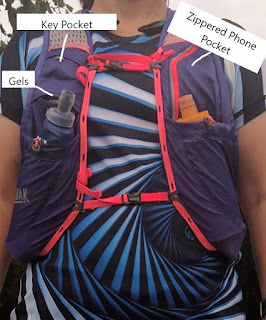 Camelbak does make water bottles to go in this vest, but I didn't purchase those. I have an 18 oz Salomon soft handheld. I don't really care for the way it straps onto my hand, so I don't use it much. I pulled the harness off it and used it in the vest. I also have a Nathan Exoshot soft flask handheld that I absolutely adore. It is billed to carry 12 oz, but really only about 10, but still, it's a great size for me and the harness for my hand is great for me. I don't have to have it tight, or I can have it tight. I tried to fit the bottle into the vest with the harness still on the bottle, but that didn't work too well, so I grabbed my spare Exoshot flask and used that instead. I took out the back bladder for the first run. I took it on an easy 6 miler. I really wanted to see how the vest would be without the weight and oppressive heat of the back bladder. And on a 6 mile run, did I really need more than 26 oz of water?? Above the left bottle, there is a zippered pocket that just fit my Google Pixel XL. Of note, this is the only pocket that zips. The other smaller pockets have a flap and the back pocket where the bladder goes has a flap. The water bottle pockets have drawstrings with stoppers. I took off running and the Salomon prompted squirted out of the vest pocket and plopped on the ground. No worries. I shoved it back in and tightened the drawstring and that was the end of that. I figured if I didn't have to tighten that, why should I. But then, I did. As I ran, I adjusted the straps of the vest until the front straps were as tight as they could go. As the water bottles deflated, I was a little annoyed at the vest bouncing up and down a little, but since the vest itself is very light and once the water was mostly gone, there was very little weight, I decided it wasn't too bad and the ability to have 26 oz of water and have my hands free was a big plus. I might want to try to tighten up the side adjustments a little more to help with the bouncing when there is little water, but I need the water bottles to be in front of my body and out of the way of my arm swing. When my husband was helping me adjust it the night before the first run, I immediately felt where the bottles were the most balanced for me. Vest from the back; no bladder and nothing else in the back pocket. My phone rode just fine in the zippered pocket. Since my phone is so big, it's a little cumbersome to get in and out, but not too bad and I didn't have any trouble with the phone being right there. I was happy my phone was not in my pocket and as it was very close to my bluetooth earbuds, there was no interference and I was able to listen to my podcasts with clarity. The vest might come in handy on some winter runs when I have to shed clothing while I run. 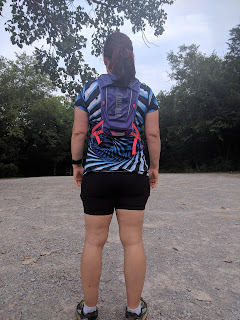 I can run with the vest with no back bladder and have that pocket to stash a jacket or arm sleeves and gloves and other such things. Hard to think about winter runs when it's 90°+ out! It was a successful first run. I need to continue to practice with it and at some point add the back bladder to it to see how it feels completely full.